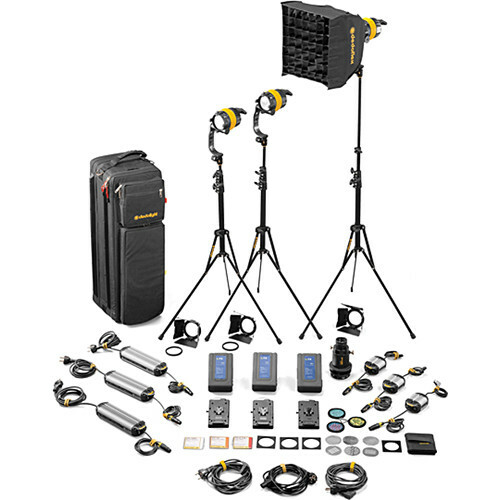 The Dedolight DLED4-BI Bi-Color LED 3-Light Master Kit offers a complete mains and battery-powered, three LED light head setup with a Dedoflex mini softbox, a DP1.1 imager, three mains power supplies, three battery power supplies, three 95Wh Li-ion battery packs with V-lock mount and integrated chargers, three DST stands, and a soft case for carrying. This provides you with a compact, yet powerful light capable of 2800-6000K that is focusable from 60 to 4°. The light is also dimmable and has an excellent CRI of >91 for excellent color rendition. Additionally, the light has tilt with permanent friction and cools passively, meaning no loud fans to interrupt shooting. The DLED4 will output up to 10,100 lux at 3' while in spot mode.